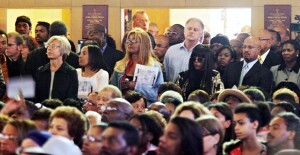 OAKLAND — An overflow crowd spilled out of St. Benedict’s Catholic Church in East Oakland on Wednesday as hundreds of mourners came to pay their respects to slain journalist Chauncey Wendell Bailey Jr., remembered as a crusading reporter, devoted father and a mentor and role model to many young journalists. Whether people knew Bailey well or not, or liked him or not, he made a difference in many lives. At least 700 people crowded inside the church, squeezed into pews, onto folding chairs or stood three deep along the back wall and up the sides to the altar. Dozens more crowded the vestibule and a long line waiting to get inside flowed down the street for more than an hour after the service began. The traditional Catholic Mass was interspersed with rousing gospel music by the Oakland Interfaith Gospel Choir and jazz — Bailey’s favorite — courtesy of members of the Oakland-East Bay Symphony Orchestra and conductor Michael Morgan on saxophone. City leaders, local clergy, fellow reporters and others in the community who knew Bailey personally or professionally spoke of his sincere love of journalism and his tireless efforts to dig out the truth and serve his community. Bailey, 57, editor of the Oakland Post weekly newspaper, was shot and killed last Thursday as he walked on a downtown Oakland street on his way to work. Police say a 19-year-old worker for Your Black Muslim Bakery has confessed to the killing, saying he did it to stop Bailey from writing negative articles about the bakery. The suspect was formally charged with murder Tuesday. “I experienced Chauncey in that very special, sometimes tenuous world — the relationship between the journalist and the politician,” Oakland Mayor Ron Dellums said. Some chuckles arose at the remark. “One thing stands out — he was always there,” he said, to rousing applause. “Whether he was the lone journalist on a sunny spring Saturday in Oakland, watching several hundred children participate in a track meet, or in a large media event, there he was, camera in one hand, tape recorder in another, listening carefully, asking the first question, setting the tone,” Dellums said. Matthews remembered Bailey’s love of reading, and his efforts to get others to follow suit. Robin Hardin, Bailey’s ex-wife, spoke of a different, more private side of the slain journalist, who she knew as a loving friend and devoted father. Friends and colleagues from around the country crowded into the church to pay their last respects, many walking past a large sign reading “STOP Black on Black Violence” held aloft by Darnell Levinston, a member of the East Bay Dragons black motorcycle club. “He was somebody that was tied to his coverage of the black community,” said Paul Grabowicz, who worked with Bailey at the Tribune and is now assistant dean of the UC Berkeley Graduate School of Journalism. Colleagues described Bailey as a consummate journalist who was always “on,” even if that meant conducting an unscheduled interview on his cell phone and writing notes on yellow Post-its that he slapped onto his arm while walking down the street, said Oakland Post publisher Paul Cobb. He always wore a suit and tie, Cobb said, so he’d be ready to jump in front of the camera when the print stories were put to bed. “I called Chauncey the James Brown of news because he was the hardest working man in media,” Cobb said, adding that his editor was like the black version of White House press corps veteran Helen Thomas. He was as dogged as an old school newsman but he was also a trailblazer, collecting and disseminating the news in different media formats long before the term multimedia was as commonplace as it is today, Cobb said. Cobb said Bailey’s voice may have been silenced, but the investigative work he was doing into Your Black Muslim Bakery’s finances would go on. Rodney Best, one of many young journalists mentored by Bailey, remembered his generous nature and his large vocabulary. He recalled a 1998 article in the Sun-Reporter with his byline, but it was really Bailey who should have had the credit. After the 21/2-hour service ended, hundreds of mourners filed from the church to the rousing strains of “When the Saints Come Marching In” and milled around outside. Bailey’s dark wooden casket, draped with a colorful African kente cloth, was carried to the front steps to receive a final blessing with holy water before being escorted in a lengthy funeral procession to Holy Sepulcher Cemetery in Hayward. Someone had placed on the casket a “756” pin commemorating the historic home run hit by Barry Bonds Tuesday night, in homage to Bailey’s love of baseball. Bailey had planned to run a special edition of the Post when Bonds broke Hank Aaron’s long-held home run record, but he never got the chance. Noted defense attorney John Burris paused to reflect on the irony of Bailey’s murder. The fact that it was apparently carried out by members of the African American community that Bailey had strived so long and hard to give a voice to, was especially painful, he said. Oakland Tribune staff writer Matthew Cooper contributed to this report.